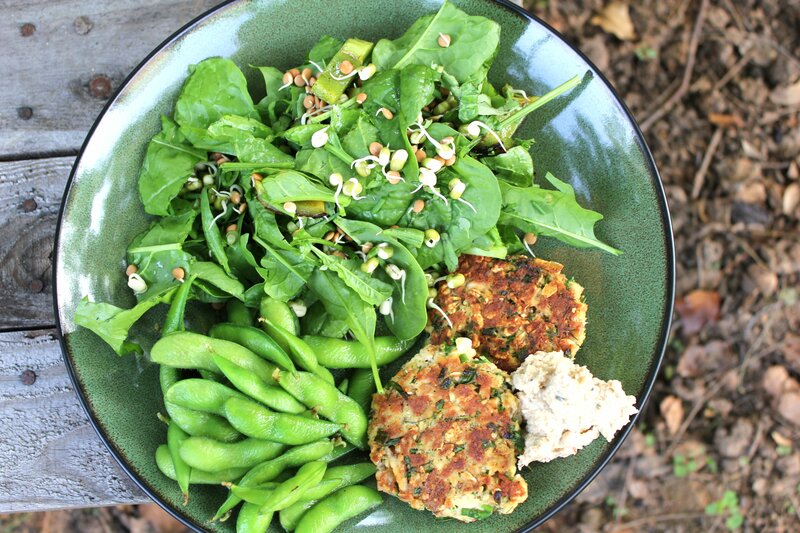 Want a crazy easy, ridiculously nutritious meal? When I was a kid my mom made us salmon burgers semi-regularly. I had a random craving in college, bought some canned fish, opened it up, gagged and fed it to the cat. Nearly 10 years after the incident I was ready to give it another try. 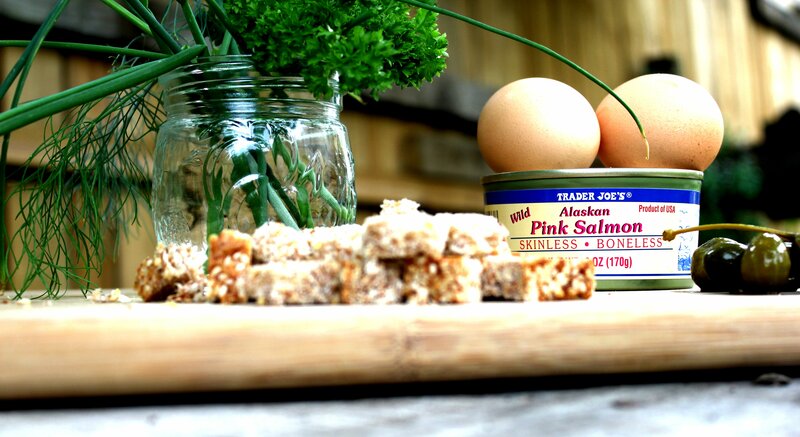 Turns out, unless you are into that sort of thing, buy the “skinless-boneless” salmon. The lesson learned and now I am hooked on the convenience and nutritional stats of this easy summer meal. Mash everything-except butter and garlic-together in a bowl. Set aside. In a skillet heat about a teaspoon of the butter on low-medium heat, add garlic, and cook until just soft. Add garlic to salmon mixture and give it all a good stir. Add another teaspoon of butter to skillet, use your hands to form patties, gently add patties to hot skillet. Cover with a lid. Flip after a few minutes, cover, remove when both sides are golden brown. Repeat with remainder of mixture. I made 5 three-inch patties. 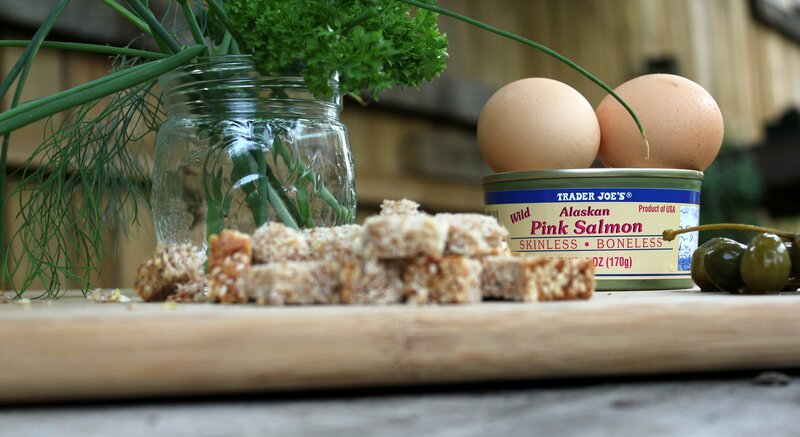 Wild salmon and walnuts are awesome sources of Omega-3 Fatty Acids which contribute to joint and cardiovascular health as well as improved mood and cognition. Whole, sprouted grains have higher vitamin content than unsprouted or refined grains. Pasture fed eggs have a 1/3 less cholesterol, 1/4 less saturated fat, 2/3 more vitamin A, 2 times more Omega-3’s, 3 times more vitamin E, and 7 times more beta-carotene than conventional eggs. Note: “vegetarian fed” “cage free” or “organic” is not the same as pasture-fed! It’s hard to find pasture-fed eggs at a conventional supermarket so seek these babies out at farmers markets or local health food stores. It’s so worth it. Oats, do I really need to say more? Ok, just a quick reminder; soluble fiber=positive influences on overall cholesterol,high satiety, and regularity. Garlic is full of the natural antibiotic allicin. Fresh herbs are a great source antioxidants which reduce damage to cells by stabilizing free radicals. 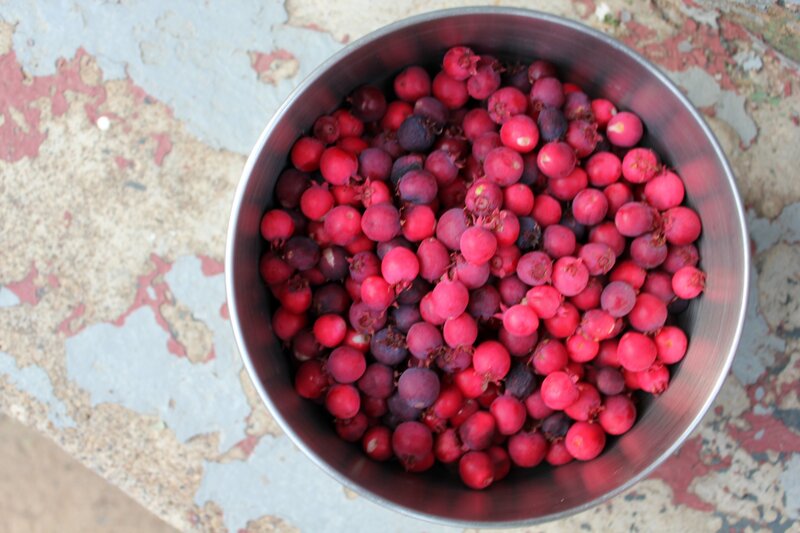 Cayenne increases circulation, boosts metabolism, and makes food more satisfying. Organic, grass-fed butter is an excellent source of Omega-3’s, vitamin E, and conjugated linoleic acid. The benefits of eating pastured eggs and butter proves, once again, that whole foods win out of processed ones every-time. The cows and chickens in the pasture eat the fresh food that is full of nutrients provided by the sun and soil. 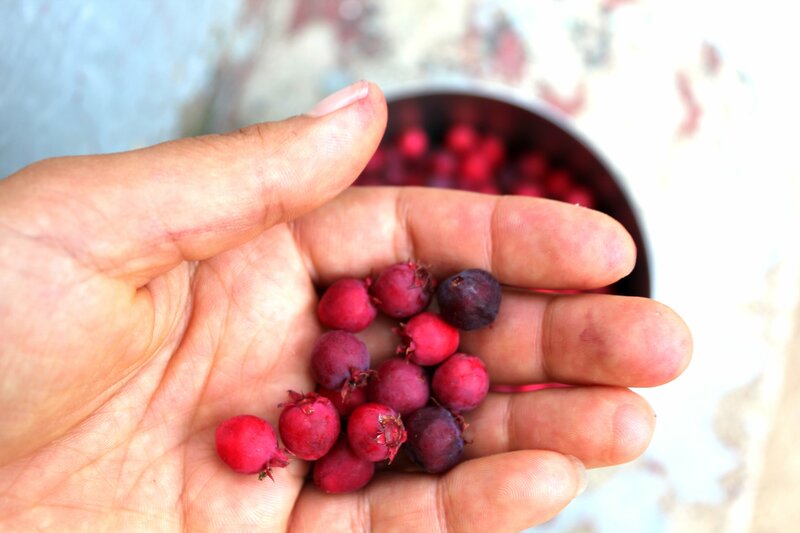 What better dessert after a superfood dinner than serviceberry‘s straight off the tree?